Is there a cheap reliable way to predict protein structure from DNA? Could you describe a cheap, easy & reliable way of predicting protein structure from sequence please? Tina - The short answer to the question, how easy it is to predict the structure from sequence is, sometimes it’s very easy and sometimes it’s very, very hard. Proteins in cells of all living organisms are linear polymers of about 20 different building blocks which we call amino acids and the way they fold into their 3D structures is what determines their function. So, if a protein is able to fold to a single and specific 3D structure, us scientists should in theory also be able to predict that same structure by just looking at its sequence. 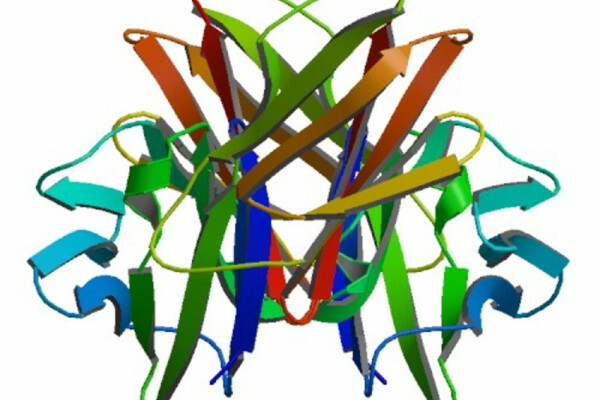 It is easy if there is a homologous protein for which the 3D structure is already determined, for example by x-ray crystallography. Homologous means that proteins are evolutionarily related. It means that they are protein brothers or cousins. So, if we know the 3D structure of a closely related protein, we can easily and quite accurately predict what the structure of its close cousin will be. What can we do if we can't find any protein cousins? Well then, it gets harder. But luckily, although only in the human genome, we have around 25,000 different proteins, we have so far in all of nature, found only a couple of thousand different ways in which any protein can fold. So, we can then take our sequence string and try to thread it in all of those possible combinations. Every year, there are more and more new experimentally solved protein structures, but there are fewer and fewer new folds. However now and again, we do have a completely new protein which folds in a way we have never seen before. And here, we come to the very, very, very hard predictions. In these cases, there is nothing else to do, but to use all of our knowledge in biophysics and chemistry and just start from scratch. Kat - That was Dr. Tina Perica, at the MRC LMB in Cambridge. Previous How do birds fly in a flock? Next Do any other species practise dental care? Could life's building blocks have formed in space?